Coreopsis is a genus with approximately 100 species, both annual and perennial. We will deal mostly with the perennial varieties in this article. There are over a dozen of these plants grown for their showy blooms used regularly in modern gardens. Considered by many gardeners to be one of the best native wildflowers for use in the garden. Plant Highlight; Coreopsis Common and Botanical Name: Coreopsis are sometimes called Tickseed. Hardiness Zones: Tickseed, or Coreopsis, is hardy in zones 3-8. Bloom Time & Color: Coreopsis typically bloom bright yellow, daisy like flowers all summer and into the fall. It is known for its long bloom season. Plant Category: Coreopsis is an herbaceous perennial. Foliage: The foliage of most Coreopsis is green, with cut leaves or a fern-like, thread-leaf look. Generally the foliage is a nice clump below the flowers which are lifted up above the foliage on long, wiry stems. Growth Habit: Some Coreopsis plants are very compact, while others are more informal and sprawling in growth habit. All are bushy and well-formed plants. Dimensions: Most Coreopsis grows around 2' although it can vary drastically between cultivars. This plant is so popular in the garden that many new hybrids have been produced to allow a Coreopsis for any purpose in the garden. 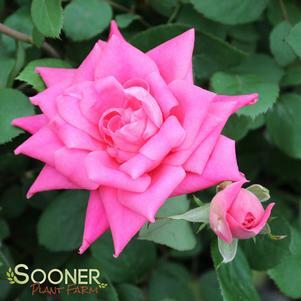 See the specific varieties and cultivars information at the bottom of this article. Preferred Conditions: The Coreopsis is very easy to grow and will tolerate any soil except waterlogged soil. 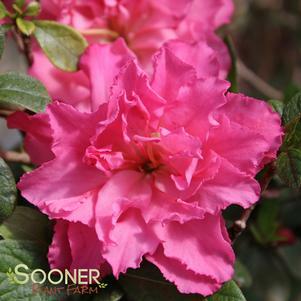 It prefers lean, sandier soils and requires little watering once established. Full sun is preferred for prolific blooms. Very little fertilizer, if any, is needed, especially once established. Maintenance: Little fertilizer and watering is needed for Coreopsis once established. Dig up your Coreopsis clumps every three years or so to divide in the fall after blooming or in the early spring. Deadheading will encourage prolific blooming. Pests or Diseases: No major diseases or pests impact Coreopsis health. Propagation Methods: You can grow Coreopsis from seed by planting once the ground is 70 degrees, but with the perennial varieties you will get blooms right away the first year by purchasing established plants. Propagation also occurs through division. Companion Plants: Any of the other prairie garden type plants such as 'Mango Meadowbrite' Echinaecea, False indigo, or Delphinium would make great companions for the Coreopsis. Also, consider combining with contrasting, vertical plants such as Allium or Daylilly. In terms of color the Coreopsis combines well with almost any other plant. Seasons of Interest: Coreopsis has interest spring through fall with attractive foliage color and texture. It also has winter interest when the dried foliage turns cinnamon brown and creates a fine-textured effect. Of course, the real spotlight comes from the cheerful blooms that fill the garden with color all summer and autumn long. Uses in the Garden: The drought-tolerant nature of the Coreopsis makes it a great plant for container gardens, xeriscaping or near the road or mailbox where it won't get watered everyday. Give it a prime spot in the cut flower garden as well. Cottage, native prairie or informal borders it excels in, however several cultivars stay compact enough to make a great mass planting in a formal bed as well. Other Uses: Coreopsis makes great cut flowers with blossoms held on long wiry stems. The flowers last a long time in water. Varieties & Cultivars: Coreopsis 'Little Sundial': A dwarf form this Coreopsis only grows 10" x 10". 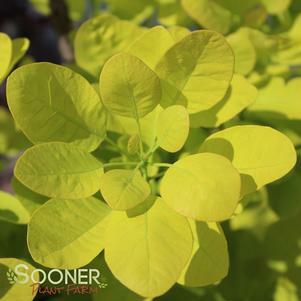 It is hardy in zones 6-9 and has bright yellow blooms with a darker center. 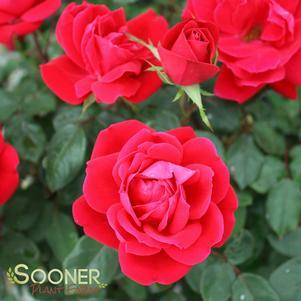 A hard-to-find cultivar well worth the effort of tracking down!For more info on purchasing this item click here. Coreopsis 'Pinwheel': A brand-new offering in 2007 this cultivar isn't easy to find yet but is absolutely stunning in any garden. 32" x 24" and hardy to zone 5 this Coreopsis has flowers that are perfectly described by its name; pinwheel shaped. The petals are not straight, but bent like pinwheels and are amazing. A must have! Pastel yellow flowers go well with any other plant for easy combinations. For more info on purchasing this item click here. Coreopsis auriculata 'Nana': The first Coreopsis to bloom each year this sometimes is called the mouse-eared or dwarf-eared tickseed because of the small lobed leaves. 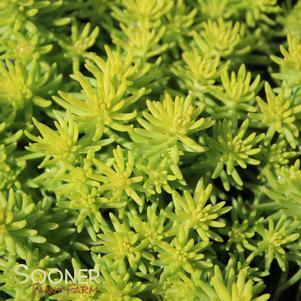 Only 2-4" tall this Coreopsis makes a beautiful mat of dark green foliage as a ground cover, but with amazing yellow flowers that bloom from April to September. Hardy zones 4-10. For more info on purchasing this item click here. Coreopsis auriculata 'Snowberry': This Coreopsis is hardy in zones 3-8 and grows approximately 32" x 24". A very unusual coloring, this cultivar blooms a creamy white flower with burgundy red center. 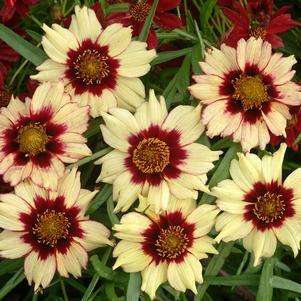 This Coreopsis combines especially well with other varieties because of the pale colored flowers. For more info on purchasing this item click here. Coreopsis grandiflora 'Sunray': A prolific and repeat-bloomer this Coreopsis is also one of the most widely adaptable as it is hardy in zones 3-9. Large golden double and semi-double flowers make this 18"x18" perennial a must-add to any flower border. An especially good cultivar for cut flowers as these blooms can be 2" across. For more info on purchasing this item click here. Coreopsis grandiflora 'Tequilla Sunrise': This amazing Coreopsis has variegated foliage which serves to bring out the bright yellow blooms even more. 12-16" x 12-16" and hardy in zones 5-8. It would be worth planting for the foliage alone but large, cheerful blooms are a bonus. For more info on purchasing this item click here. Coreopsis hybrida 'Autumn Blush': Related to 'Nana', the two look great together in a border. Hardy zones 4-9 and growing 32" x 24". Pastel yellow blooms with wine-red eyes make this a real beauty in the mixed border. For more info on purchasing this item click here. Coreopsis hybrida 'Crème Brulee': A much softer yellow bloom make it very easy to combine this Coreopsis with other plants. Hardy in zones 3-9 this Coreopsis has a more yellow-green foliage and flowers form along the stem, not just at the top of the stem like with other tickseeds. Grows to 18"x18". For more info on purchasing this item click here. Coreopsis verticillata 'Moonbeam': This Coreopsis was the 1992 Perennial Plant of the Year and with good reason; a mass of yellow blooms floats above the delicate fern-like, foliage making this a versatile and popular plant. 24" x 18-24" Moonbeam continually blooms even if never deadheaded. For more info on purchasing this item click here. Coreopsis hybrida Sweet Dreams Coreopsis, Soft pink flowers with a purple-red dark center. A color break through in Coreopsis! 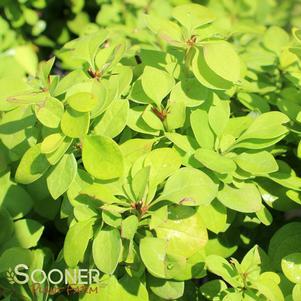 Perfect for mass planting or as a specimen plant. Create a airy container for all summer beauty. For more info on purchasing this item click here. 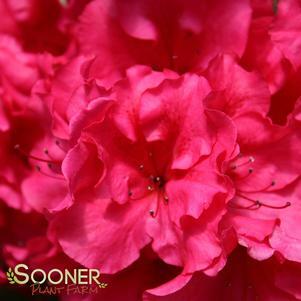 This 'Plant Highlight' was written exclusively for Sooner Plant Farm by Angela England .To read more from this talented writer about other highlighted plants and interesting gardening stories click here. All copyrights reserved by Sooner Plant Farm. No reproduction of this article in whole or in part is allowed without the permission of Sooner Plant Farm. You have again exceeded my expectations with the quality and beauty of the shrubs I have purchased. Thank you!